The White Sea in northern Russia is home to 4 different species of seals and many tourists are taking a week-long photo safari to see the mammals in their natural habitat. Nilmoguba Village sits at the mouth of River Nilmo on the White Sea. The nearest rail station is actually named “Arctic Circle.” In the winter, the snow drifts reach your waist here, and you can see the Northern Lights; during summer there is “the midnight sun,” and the snow only finally melts in May. However, in recent years, this area has seen more and more ecotourism visitors. 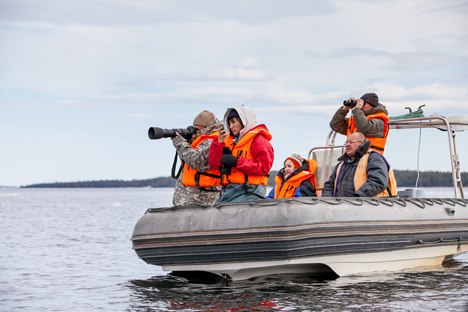 In fact, it is only here that you can take a week-long photo-safari to see seals in their own native surroundings. You can rent diving gear at Nilmoguba year-round and take a dive below the surface of the White Sea. There is also an open-air dolphinarium where they train large white whales, for which the White Sea is a natural habitat. “Will we be able to touch them?” asks a middle-aged mother who can contain herself no longer, having brought her 12-year-old son to see the seals. The other group members indulge in a furtive chuckle. The idea of showing tourists animals in their native habitats is not new, but Russia seems a somewhat unlikely country to set about doing it. Even in wildlife reserves in Russia, it is hard to guarantee that you will see the animals, while bears or elk can turn up just at the moment you were not expecting them. The Russian North can actually be a more promising location for the interaction of man and nature. The huge icy wastes are a plus: Seeing an animal on the ice is much easier than trying to find them in some forest undergrowth; with knowledge of the location and migration patterns, it becomes possible to guarantee a sighting of the animals in question with almost 100 percent accuracy. This insight is the basis of the work of almost all guides working here in the Arctic Circle, at the boundaries of Karelia and Murmansk Region. In spring, the mustachioed charmers usually gather where the smaller bays still remain icebound. Spring ice is weaker, with a melting look that seems more fragile – but it can easily support the weight of heavy seals. Seals are skilled ice-shufflers, and they can get around almost anywhere on the great ice-sheet for strategic safety: Humans cannot move silently, and the bears cannot move in from the shore. While waiting, fingers resting idly on the camera shutter-buttons are almost frozen, and eyes are watering from the wind – but none of it seems to matter for the tourists. This was exactly what wildlife activists were hoping for – to replace hundreds of years of seal-hunting with ecotourism instead. The toll of just one season's massacre, which goes on for 10 days, runs up to tens of thousands of dead baby seals. In just a single year, the activists won an important victory – a complete ban on hunting baby seals in Russia. The ban went into force in March 2009. Seal meat saved the lives of residents of Arkhangelsk and Leningrad during the hungry years of war. Arkhangelsk even erected a thanksgiving monument to the seals. Seal oil was once used for heating fuel and is even used in some folk cures. The tiny seal cubs are trusting and do not know what fear is. You can come up close to them, take photographs next to them and even stroke them – best to use gloves, though. The scent of humans does not affect the way the mothers treat their young. Still, it is considerably harder to catch sight of younger and grown-up seals. “That's why we collect together one group each year, in early May,” says Mikhail. The maneuvers of one of the ecotourism boats are finally crowned with success: They have almost come close to the unwary seals. The ice-flow beneath is not as strong as it looked, and it breaks under the weight of the sea hares. The flows roll over and then sinks into the depths on their sides – leaving a very perturbed seal face behind them. The boat breaks out into laughter and everyone takes photographs. Back at the tourist camp, the exultant spotters are eagerly discussing how they want to visit the seals again. “How about if we used herring as bait?” one enthusiast asks by way of suggestion.